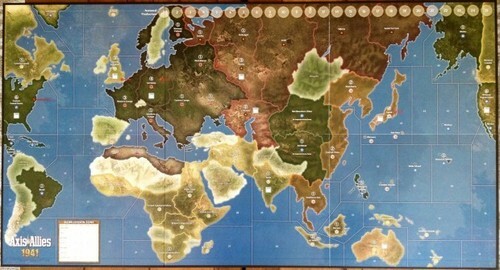 1941 : THE WORLD IS AT WAR ! 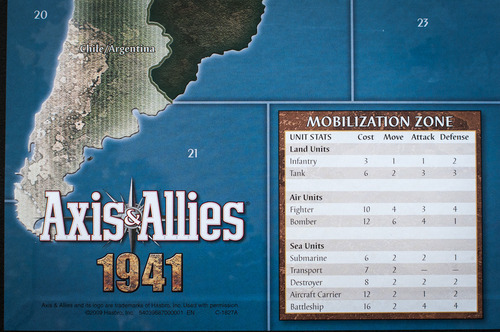 Quick and Convenient : Axis & Allies 1941 is designed to be set up and played more quickly than any previous A&A game. In essence, this is a simplified A&A experience that will introduce players to the A&A mechanics and play style. Play time runs between 1.5 to 2 hours. Familiar Mechanics : This game utilizes the A&A game mechanics present in ... <lire la suite>. 1941 : THE WORLD IS AT WAR ! 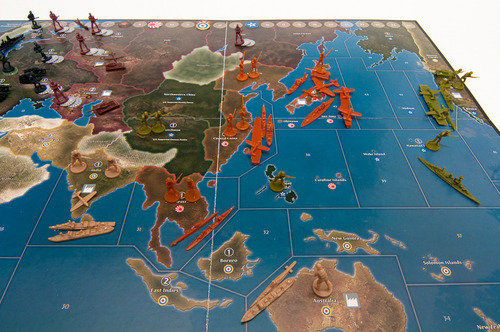 Quick and Convenient : Axis & Allies 1941 is designed to be set up and played more quickly than any previous A&A game. In essence, this is a simplified A&A experience that will introduce players to the A&A mechanics and play style. Play time runs between 1.5 to 2 hours. Familiar Mechanics : This game utilizes the A&A game mechanics present in A&A 1942 2nd Edition, as designed by Larry Harris (the creator of the original game). New Units : A key feature for enfranchised players is an entirely new set of unit sculpts. There are 16 all-new designs such as the P-40 Warhawk, Tiger Tank, AVRO Lancaster, FW-190, IS-2 tank, HMS Hood, He-111, and the Akagi Aircraft Carrier. These playing pieces can be used in any other A&A game, and will be desirable to players who seek to expand their A&A collections. 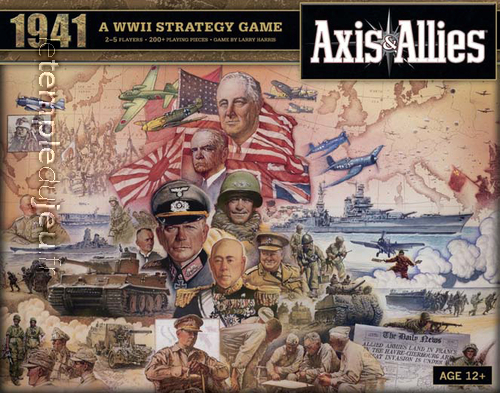 Designed for 2–5 players, the game is set in 1941 : The Axis has great momentum and is expanding its conquests in both Europe and Asia. Controlling one of the Axis or Allied powers, you will command both your country’s military forces and its war-time economy. Show that you are a brilliant military strategist by planning your attacks, marshaling your forces into embattled territories, and resolving the conflicts.Victory goes to the side that conquers its opponents on the field of battle and liberates or occupies the greatest cities of the world. Change the course of history in a few short hours !